By Community Chickens on December 29, 2010 Visit Community's Website. At times I thought we were crazy, as each chick found its way home in a makeshift cardboard box. Heat blasting from the car blower to keep things nice and toasty, I would stop at a red light, wipe the sweat from my forehead and peek in the box one more time to see the shining little eyes and all that fluff looking back at me. With that familiar, soft “peep,” a smile would involuntarily spread across my face. Yup, crazy … crazy for chickens. This year we have more chickens than I’ve ever had at once. Our flock numbers have always fluctuated, but our current number is 48, with 35 laying hens. Needless to say, as our new little girls came of age, we needed more egg boxes. 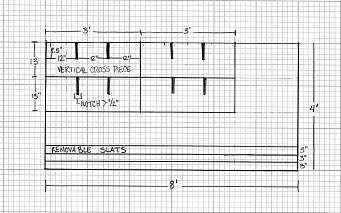 I’d like to share with you our design for building 21 egg boxes for around $30. Each box is approximately 12″ tall, 14″ wide and 13″ deep. The whole contraption takes up very little floor space, as it rises 2 feet off the ground. It has removable front slats for easy cleaning, and each row of boxes has a convenient ledge for our hens to land on before choosing a box. It’s an egg box condominium! 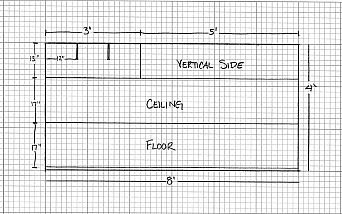 Our chicken coop is 8’x12′. 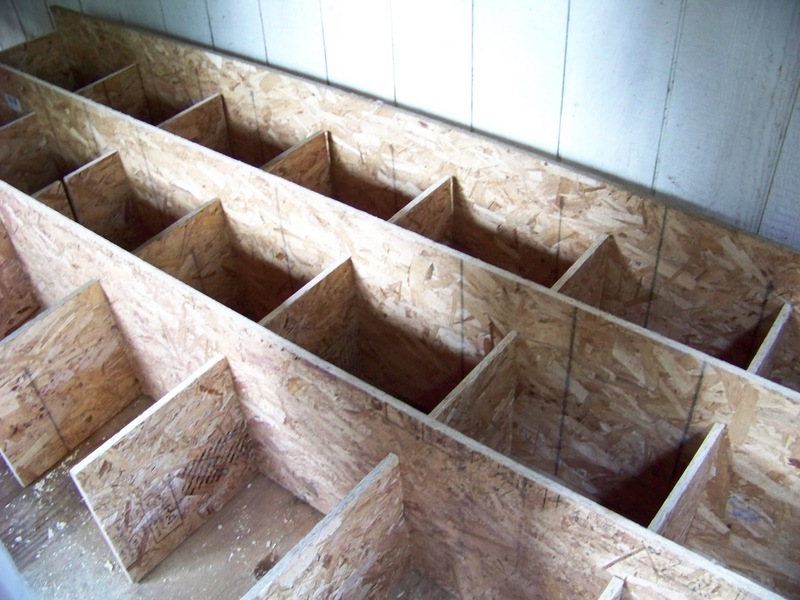 We built the egg boxes against the large wall, using the existing wall as the back of the condominium. The notches will fit inside each other and create the boxes. This design also gives additional support and eliminates the need to drill tons of screws at weird angles. The notches should be a little wider than 1/2″. We marked the width, cut the outside lines, then repeatedly used the width of the blade to cut out the remaining material. It has almost the same cut marks, except the notches will not be needed for the ceiling and floor. Once all the pieces were cut, we assembled the condominium laying down. Start off by assembling the sides and the ceiling. 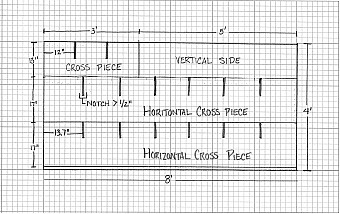 Lay the 6 vertical cross pieces inside the frame, notches facing up, parallel to each other, approximately 14 inches apart. Interlace the 2 horizontal cross pieces with the notches facing down into the notches of the vertical pieces, until you have what looks like a tic tac toe board on steroids. You can now add the bottom. We screwed the boards into the ends of the perpendicular cross board, but you can use “L” brackets to make things easier. Ask a friend who loves chickens as much as you do to help you lift the whole thing upright against the wall. Use “L” brackets to attach the condominium to the wall, and give your friend some free eggs. 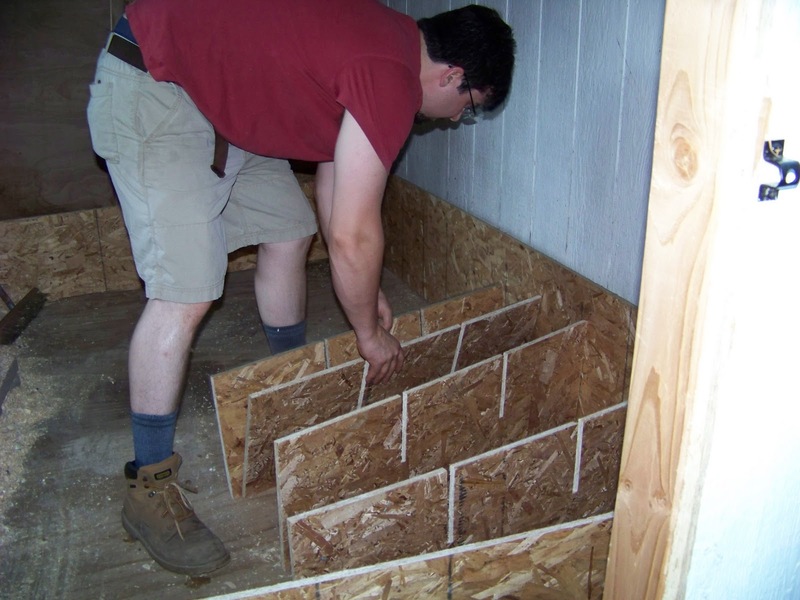 Use the 2′ 2×4″ pieces vertically at the bottom, toward the front to give the whole structure extra support. Screw a few screws in the floor of each ledge, so that an inch or so of the screw is still exposed, approximately 1/2 inch from the wall of the boxes. This will hold the removable slats upright. The removable slats will be around 3″ tall and will slide in and out for easy clean up of the boxes. We simply remove the slats and brush out the soiled chips with a hand broom or trowel, replace the slats and fill each box with clean pine chips. 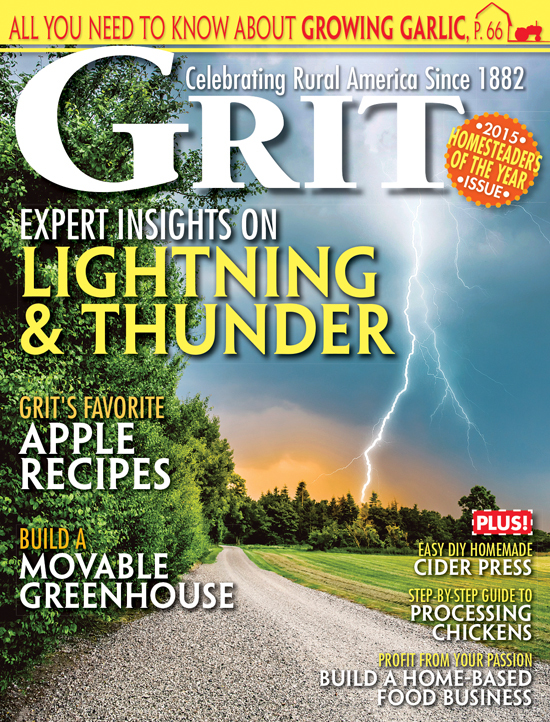 Check out all the new and exciting things we do around our farm. Visit Iron Oak Farm. I’m posting a link to this in a post coming up soon. Great idea and thanks for the detailed plans! I do have to agree with Chicken Wisperer on only a few boxes will get used. I have about 14 layers and 6 boxes…. they will normally only use 2 or 3 of them. And of course 1 of the hens has started to use one of them as her roost. But, an easily solution with 21 boxes…. get more chickens! Farm fresh eggs always sell! I LOVE that the perch panel comes off for easy cleaning! What a solution to a very common age old dilema. Thank you for such a fantastic idea. Very creative! Nice job! Just don’t be surprised if only 4 or 5 of the 21 nesting boxes actually get used. 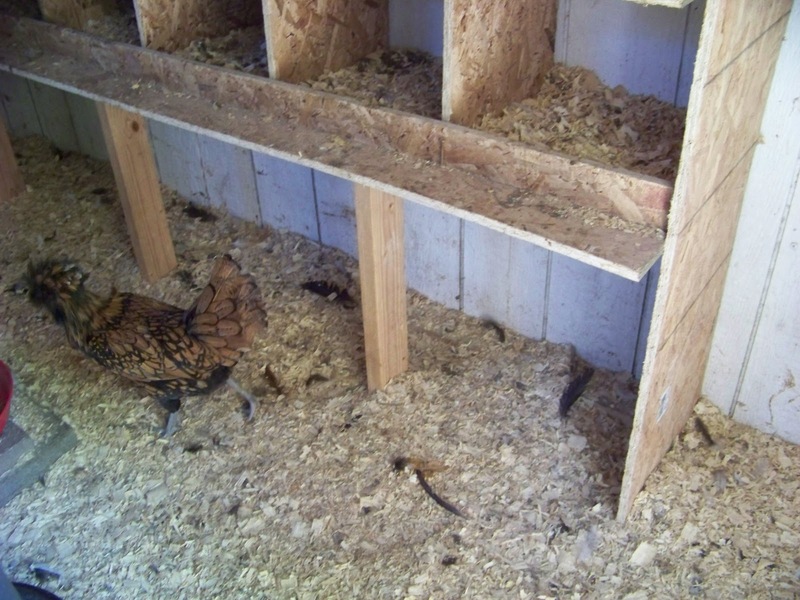 One nesting box for every 3 to 5 laying hens is ample. 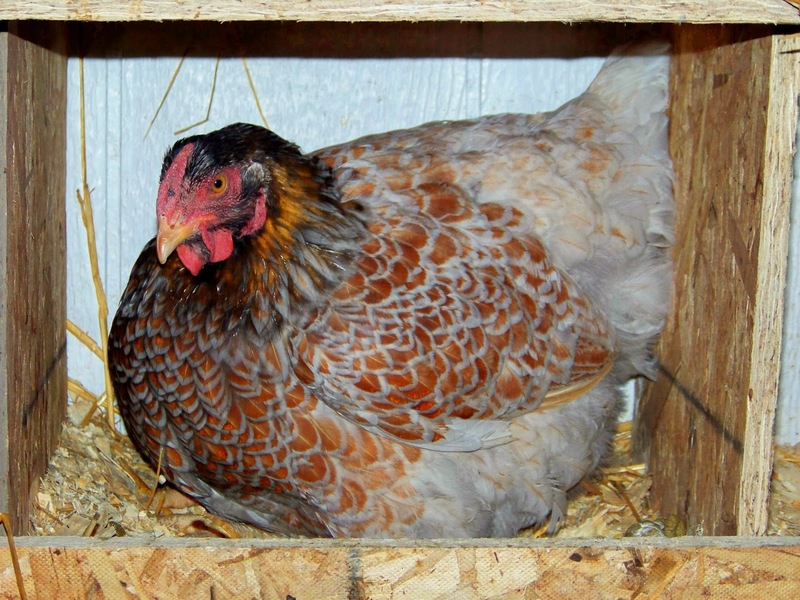 Too many nesting boxes will also invite the hens to sleep in them instead of on the roost. This will cause them to fill up with poop, which will cause additional clean-up time and poop covered eggs. One of our coops has six nest boxes and the 13 hens use two of them. 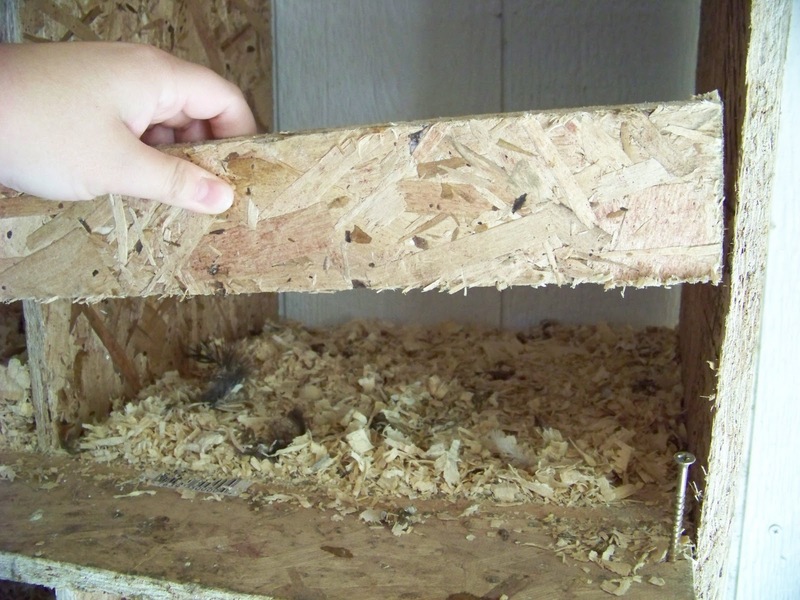 Also, many people prefer metal or plastic nesting boxes because the joints of the wooden nesting boxes are great hiding places for mites and lice. Anne, awe, so sorry to hear about your opossum encounter. Your nesting boxes sound great! Functional and recycled, both good things. You are more than welcome to come see us. We love visitors! We have a closed coupe policy, (mostly just for shoes) but we have a dutch door that you can look inside or view the birds free ranging, and by all means you can hold them and look them over. I’m already starting to sort out breeding pairs, taking a good look at who’s who and that sort of thing. I have our Roosters separated from our hens right now to cleanse them of all cross breeding. And starting at the end of this month I’m going to start pairing them off and collecting eggs for the incubator. Let me know what your interested in and I can put you on a waiting list. I really enjoy your blog! I only have 6 hens (due to some unfortunate encounters with a possum). I made a nest box from a second hand hexagonal end table, which I mounted next to a wall of the coop on top of a couple of concrete blocks. I removed the screws from the top piece, and now I can easily lift it off to retrieve the eggs. It cost almost nothing, and works great! I live not far away, in Commerce Township. I would be interested in visiting your farm, maybe in the spring, and maybe purchasing a couple of Maran pullets, if you have any available. I’ve seen Jennifer’s chicken boxes and they are sturdy, functional and visually appealing. If I were a chicken, I would be very pleased! Oh what a good set up. It is a bit like an IKEA bookcase I have. My flock is growing and I am using catchers of old lawn mowers for nesting boxes. I may have to think about building up as the girls need more nests.